Unlike almost all other tongues spoken in the world today, Basque is considered to be a language isolate, meaning that it cannot be linked to any other living language. This fact alone adds a certain air of mystery to the language, causing many people to want to learn the subject even if their only reason for doing so is to keep it alive. Others have more practical reasons, such as planning a vacation to the Basque Country, for their studies. Colloquial Basque: A Complete Language Course, written by Alan R. King and Begotxu Olaizola Elordi, is a resource that attempts to satisfy all the various reasons student might have for embarking on the study of the Basque language. The current edition of the collection includes a 256 page book and a CD that is 120 minutes in length. Older editions of the language study pack include cassette tapes instead of CDs, and you should still be able to find them in many used book outlets if you prefer that method of audio instruction. Colloquial Basque is an entry-level language study program that assumes no prior knowledge of the subject. Although used in many formal courses, the package has been designed so that it can easily be used as a self-study tool as well. As the title of the course suggests, the primary audience targeted by Colloquial Basque is the traveler who plans to spend some time in Basque Country and wants to be able to converse in the native tongue, even if it is at the most basic level. However, this doesn’t stop the resource from being valuable to others who just want a good introduction to the language either as preparation for further studies on the topic or just to broaden their own general knowledge base. In my opinion, the book and CD set is an excellent resource for any beginning student of the Basque language. The Colloquial Basque course focuses on a conversational style of instruction, explaining the grammar and structure of the language as needed. In short, the book’s emphasis is on being able to communicate in Basque, and it tries hard not to get too bogged down in technical aspects of the language. A number of references to contemporary Basque culture are interspersed throughout the book. These tidbits of information add a lot of color to the subject and are invaluable to students who really want to understand the language in the context of Basque lifestyle. Colloquial Basque is divided into 12 units, each one concentrating on a particular conversation venue such as shopping or asking for directions. In order to break up the material into more manageable segments, the units are divided into groups of smaller lessons. This is an ideal structure for self-study students who may only have 15-20 minutes here and there to devote to the course. Each lesson starts with a dialog or some other written Basque text. In addition to the written segment found in the book, almost all of the conversations can be listened to on the accompanying audio materials. The speech does tend to get a little fast in places, mimicking the actual speed of conversation used by Basque natives, so you may need to listen to the dialog several times. Instead of being gathered together at the end of each unit, exercises are scattered throughout each lesson in order to reinforce points as they are introduced. An answer key is found at the end of the book, but it’s not quite as comprehensive as I would like it to be. On one hand, this can be explained away by noticing that many of the exercises ask you to “make up a conversation" on a certain topic so there is no real definitive answer. On the other hand, I’d still like to see examples of such conversations that students could use to increase their understanding of the material. Very brief Basque-English and English-Basque dictionaries are included in the back of Colloquial Basque but, like most language textbook dictionaries, they leave a lot to be desired. The combined total of these two appendices is only about 21 pages long so they’re not going to be overly useful for a thorough understanding of the language. If you’re serious in your studies of the Basque language, I would advise purchasing a copy of Basque-English, English Basque Dictionary by Gorka Aulestia and Linda White to accompany this course. You won’t find a more comprehensive Basque-English dictionary on the market in this price range – it can easily be purchased for under $20. 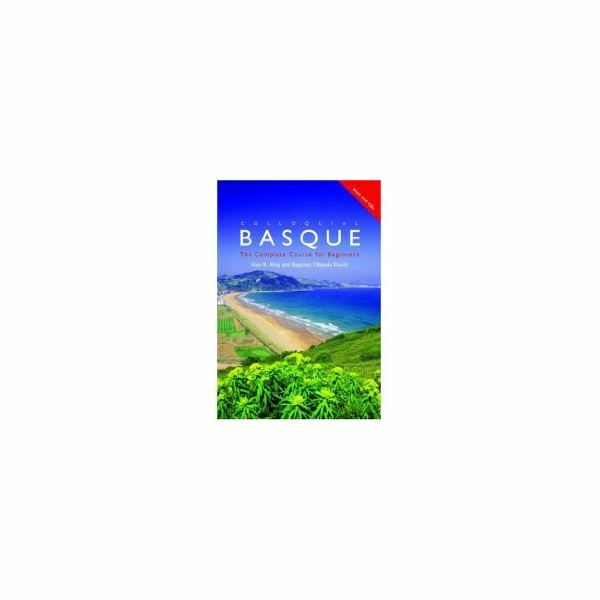 Colloquial Basque: A Complete Language Course has a list price of $67.95, but it can generally be found a bit cheaper than that. At the time of this article, Amazon.com offers the package for $53. If you have no interest in the companion CD, you can save some money and pick up the book alone for $39.95. However, I highly recommend investing the extra few dollars and getting the main bundle with both book and CD. This course is a very good beginning to the study of Basque. While it doesn’t not take you deep into the technicalities of the language, it lays a foundation for further study for those interested. The conversational style of instruction is comfortable for beginning students. The way the course is broken into units and then smaller lessons is sensible, allowing a reasonable amount of study to be done in a 15 or 20 minute period. Contemporary references and sections on language usage are included to prepare the student to actually use the language with native speakers. A larger dictionary would have been useful- probably the least adequate portion of the course. The inclusion of exercises scattered through the course rather than at the end of units, is good, as it reinforces points, but the answer key could be more comprehensive. While it can be purchased as just a book, the added material on the CD is one of the things that makes this language tool such a worthwhile purchase, with its focus on conversational Basque as spoken by true Basque natives, and the combined total is very reasonably priced.